Scotch lovers rejoice: This set includes four monogrammed drink chillers and facts on whisky history. A thousand or so years ago, traveling Moors brought the distillation process to Europe. It took on a special sort of magic in Scotland, where it was used to make uisge beatha, "the water of life." Today, that "water" is better known as Scotch whisky, and its fascinating history makes it all the more enjoyable. Add to your Scotch knowledge (while perfecting your drink presentation) with this set of elegant monogrammed whisky chillers. The four stainless steel cubes keep Scotch at just the right drinking temperature, while your custom initial adds an extra spot of charm. 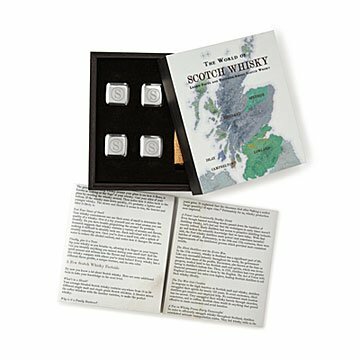 The set also includes a sturdy wooden gift box, a bag for storing the cubes in the freezer, a booklet full of Scotch facts (for example, it's Scotch whisky, but Irish whiskey), and a map of Scotland's distilleries. It's a smart addition to any whisky (or whiskey) fan's bar, and makes a thoughtful gift for the history buff who's always down to sip a single malt. Made in Houston, Texas. When Houston-based designers Valvert Thompson and Steve Shi bought their first engraving machine, they planned to use it to make acrylic desktop accessories. Their first few tries didn’t go so well, and they ended up creating pieces they weren’t entirely proud of—but they didn’t get discouraged. Instead, the team did a little research and set their sights on creating personalized products. While sourcing materials, they had their “eureka!” moment. They wondered, “Why should businesses waste products that aren’t flawed, when each product can be upcycled into something special?” This question led the pair to begin upcycling otherwise unwanted pieces by printing or engraving on them. By bundling previously unloved items with educational material like posters and pamphlets, they’re able to create new, meaningful products. To this day, Valvert and Steve are constantly experimenting with new designs and “inventing” uses for materials that were once forgotten. Hand wash chillers with warm water and dry. Terrific product - better than expected. The gift is stylish and functional and the quality is first rate. One of the cubes came scuffed up. Wouldn't clean off so it's scratched on the cube. Disappointing.